Discussion in 'Model S' started by Dennis, Feb 21, 2017. So, on Feb. 11, I got in the car very early in the morning and started it to go attend the Lucid Motors Cars and Coffee EVent in Aliso Viejo. 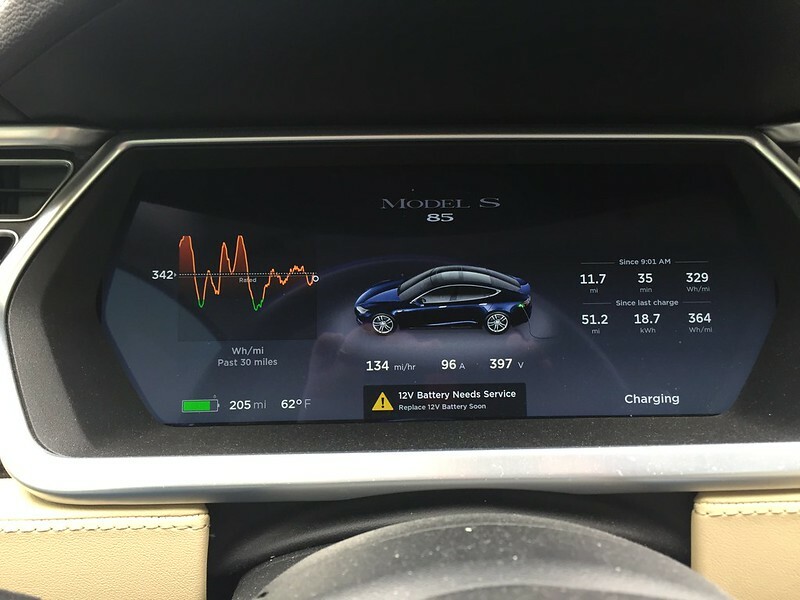 To my surprise, my Model S popped up with a warning about the 12V battery. It states "12V Battery Needs Service! Replace 12V Battery Soon." After over 70,000 miles in the Model S since November 2013. I have never seen this error. However, I have heard many earlier Tesla Model S owners that had issues with 12V batteries and how the low voltage system had been a particularly painful nemesis for their experiences. This had not been my problem, but wanted to err on the side of caution. I was in a rush to make it to Cars and Coffee in the early morning, and I knew that over the hill from the EVent was a Tesla Service Center, so I did not panic and called Tesla's Roadside Assistance number to get their advice. The agent on the line had mentioned that this particular error message was NOT the onerous one, but rather a proactive one that can be taken care off by my normal service center during regular hours. So, he took my information to have my regular service center contact and schedule the 12V replacement with me. I went to Cars and Coffee and got to meet the Lucid Air for the first time. After the event, I was going to be passing by the Costa Mesa Service Center on my way home that I decided to double check what the agent at Roadside Assistance had mentioned, and stopped off at Costa Mesa to see if they can address the issue. The service representative at Costa Mesa that was checking people in had told me that Saturday service was a skeleton staff and that he could schedule me for the battery service at another date. I declined and decided to wait for my regular service center staff to get in touch with me. I got a call on Monday from my "regular" guy and he mentioned that he could send a Ranger out to help (for those unaware a Ranger is when a service center sends out a technician to your site rather than have you bring the car in to the service center), but they were currently out of stock on the battery and would be back in touch when the 12V was back in stock to get it scheduled. This was a week ago yesterday. Yesterday, on President's Day, (approximately nine days since the issue), my regular guy got a hold of me, sent a Ranger to my home, he replaced my 12V and I was presented a $0 due bill to sign. I was surprised to have a $0 bill for 12V battery considering that I'm at 70,000 miles AND I assumed that the 12V was a consumable item and would have had to pay for it. We did purchase the extended warranty that kicked in after 50,000 miles. So, I guess that was what covered the battery. Needless to say, that's a pleasant surprise. Interesting to note that Tesla announced the expansion of Ranger service a few days after they came out to service my 12 V battery issue. I wonder if I helped convince them to do so. Nice. I pay 350€ for replace the 12 v batteri in sweden. Now they want 350€ for the driver safetlybelt. My Toy is a P85+ Koenigsegg signature 2013.10.09 with 97500 km.